Ohio Interfaith Power & Light (Ohio IPL) seeks a dynamic individual to serve as Executive Director. The Executive Director will guide the organization toward fulfilling its mission and living into its vision and by its values. 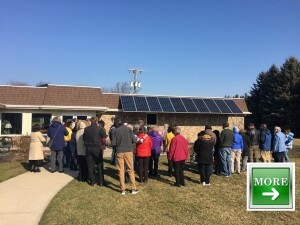 Ohio IPL is one of nearly 40 state affiliates of Interfaith Power & Light. Building upon our successes over the past 11 years in energy conservation programs, development of spiritual resources, educational outreach, and advocacy, our new Executive Director will lead efforts to grow the initiatives and programs of the organization, and seek funding and staffing to support this growth. Staffing could increase from several part-time consultants working on a contract basis to multiple employees led by a full-time Executive Director. We seek candidates who have an active faith commitment to protect people and planet from climate disruption, who seek to promote justice for all of God’s creation, and who will foster the diversity of our work. Experience with non-profit boards, diverse faith communities, climate change and sustainable energy, environmental justice, fundraising, program development, management, and advocacy are all important. We understand that some excellent candidates might need to learn on the job about one or more of these areas. Excellent written and oral communication skills are critical. Ability to represent Ohio IPL with confidence and sensitivity to a variety of audiences (all ages and backgrounds) and in varying situations. Familiarity with social media, Google Docs, Word, Excel required. Experience with WordPress, Salsa, and other web design and CRM programs desired but not required. Must be an Ohio resident; preferred location is Columbus area, but this is flexible. Some travel is required for this position, including out of state travel several times per year. Must have reliable transportation and Driver’s License. Mileage expenses will be reimbursed. The Executive Director will be hired as a consultant working on a contract basis half-time to two-thirds time. Depending on fundraising, the contract position will move toward full-time within the next 18-36 months. Salary range for the position is $30 – $35 per hour depending upon benefits needed. Interested applicants should submit a cover letter, resume, and list of at least three references with contact information to [email protected] CLICK HERE to download this job posting. Applications will be accepted through March 22, 2019.